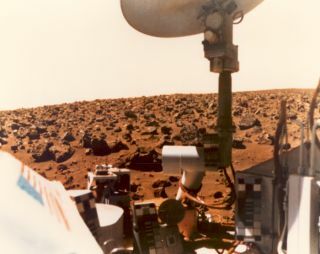 In this historical photo from the U.S. space agency, Viking 1 obtained this color picture of the Martian surface and sky on July 24, 1976. Camera number 1 facing southeast captured part of the gray structured spacecraft in the foreground. A bright orange cable leads to one of the descent rocket engines. Orange-red surface materials cover most of the surface, apparently forming a thin veneer over dark bedrock. A zone of large dark boulders is present in the far-field. The sky has a reddish cast, which is probably due to scattering and reflection from reddish sediment suspended in the lower atmosphere. This picture had been radiometrically calibrated, using information on camera performance acquired before launch. Although the colors are very vivid the fidelity with which the bright orange cable is reproduced suggests the intense colors of the Martian surface.